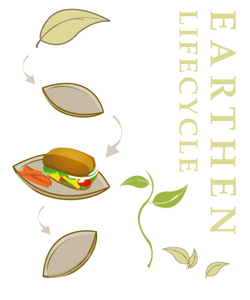 Committed to reducing our ecological footprint, Earthen dinnerware like Earthen palm leaf plates offers a green alternative without losing the convenience of single-use plates and bowls. Each Plate/Bowl is made from a single fallen palm leaf and is unique in color and texture. This stylish dinnerware made from fallen leaves, a naturally biodegradable and renewable raw material, offers high utility, aesthetic appeal, and environmental value.